On November 3rd, 2016, the Walkway commemorated the 74th anniversary of the raising of the Australian flag at Kokoda village. This event marked the successful advance by the Australian Army back across the rugged Owen Stanley Ranges to the Northern New Guinea coastal plain. Those attending the commemoration were also aware that the following month would represent 75 years since the beginning of war with the Empire of Japan, following sudden attacks on Pearl Harbour and other US, British, and Dutch bases. The official welcome was given by Mr John Haines AM, Chairman of the Walkway and NSW State President of the RSL. The Walkway was fortunate in having a Catafalque Party provided by the 4th/3rd Battalion – Royal NSW Regiment. Prayers were lead by the Reverend Paul Weaver, Anglican Chaplain of Concord Hospital. The following month Paul retired from the chaplaincy, after some 14 years of valued service to the Hospital and this Walkway. The Walkway Board wishes him well in retirement. Music, an all important contribution to a fitting commemoration, was once again provided by the NSW Corrective Services Band, and solo tenor Kent Maddock sung Sir Hubert Parry’s beautiful old hymn, “Jerusalem”, as well as the “Lord’s Prayer”. A video compilation, in the form of a Kokoda Day Reflection, was projected onto a large screen. This audio-visual presentation traced the course of the Pacific War from the initial Japanese attacks in December 1941 through to the re-taking of Kokoda village and the historic flag raising which occurred on November 3rd, 1942. The 2016 Kokoda Day Address was delivered by Professor, the Honourable Dame Marie Bashir AD CVO. Professor Bashir noted that the year 1942 was critical in the history of modern Australia. 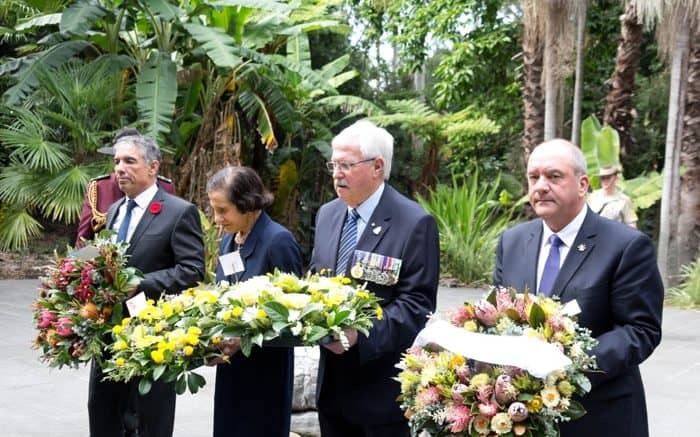 Having been thwarted at the Battle of the Coral Sea in their plan for a seaborne assault on Port Moresby, the Japanese, Professor Bashir said, opted for an overland route along the rugged Kokoda Track. It was, as the Professor emphasised, some of the worst terrain of the Pacific War in which to fight a battle. A full audio file of Professor Bashir’s address can be accessed from this page. The Australian Flag Raising was undertaken by Mr Ray Gentles, a New Guinea war veteran who served with the 55/53rd Battalion. Mr Michael Ali OAM, raised the Papua New Guinea flag in honour of all those from our neighbouring country who supported the Australians and gave such splendid assistance to the wounded. Mr Ray James, State Councillor, RSL NSW, recited the Ode, and towards the conclusion of the commemoration, Board member, Brigadier Phil McNamara CSC ESM OAM, thanked all those in attendance and those who contributed to make the day a fitting tribute to those remarkable Australian servicemen who turned the tide of battle at such a critical time for our country.